The first non-stick herb grinder ever. A 4-piece grinder that was ahead of it's time. Find out how we did it using ceramic, and zero teflon. The SLX 303 4-piece grinder delivers years of engineering into the palm of your hand. We applied our technically advanced ceramic coating to the most ergonomic grinder in existence, perfectly combining form and function. Note: We no longer manufacture V 1.0 (the 206 & 303). You may still find one on a shelf, so we have left these pages up - but check out the SLX 2.0 pages for our current product line. The SLX 303 is designed to meet the expectations of the most demanding users. Weighing in at 6 ounces, it’s heavy enough resist being knocked over, yet light enough to travel with ease. Four sections with matching threads offer full customization - take the top off and use it as a two piece, or remove the screen section and use it to store ground material securely. What's in a screen? More than you think. We chose a screen to do one thing: ensure that only the highest quality pollen falls through. Many inferior grinders use a wider mesh in an attempt to make users believe their grinder collects more pollen - when in fact, it’s just letting other plant matter through. Why a four stage grinder? If you prefer the ultimate in ease of use, the 303 is for you. Just put your material in, and the perfectly sized holes will automatically drop the grind through to the second stage. No guessing whether it's too fine or too rough. The second stage includes a heavy-duty screen - optimally designed to collect only the finest pollen and leave everything else behind. Sometimes you only need two pieces. The ultimate 2 stage grinder. The SLX 206 offers a cultured experience, seamlessly melding simplicity with our technologically advanced coating. Raw functionality at the expense of nothing. A new classic in the making. 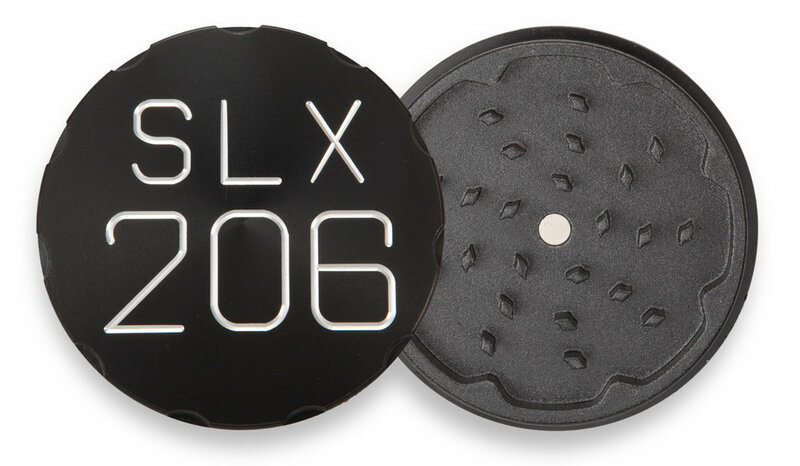 When you choose the SLX 206, you’re choosing the pinnacle of 2-piece grinder control and precision. Elegant, with impeccable balance and nothing to knock over or spill, the SLX 206 offers the ultimate in refinement. If you like complete control, the 206 is for you. The 206 2-piece provides the freedom to determine how fine your grind is, with the simplicity of open and close operation. No threads to loosen, no parts to lose. Nothing except the beauty of black ceramic on top of perfectly machined metal. If you already use a two stage grinder, you’re familiar with the benefits. If you use a four stage, or don’t use a grinder at all, it might be time to make a change. Do you vaporize or bake? The 206 is the perfect companion for the kitchen or medical user. Traditional 2-piece grinders have long been preferred by those who need the finest grind possible. Vaporization and cooking both require maximum surface area for best results - a task the 206 excels at. Just turn until you have powder, drop it in your vape or mixing bowl, and you’re good to go. And because the grinding plates are 100% coated in our FDA approved ceramic coating, everything you put in comes out. No more wasted material stuck inside your grinder, no possibility of aluminum shavings. Now check out SLX V2!